You might spend the majority of your “free time” in your living room. This is why living room Feng Shui is so important. Whether you’re watching television, reading a book, listening to music, entertaining guests or perhaps playing a musical instrument, this room can keep you busy for hours. One of the first decisions to make with regards to the living room is its purpose. The purpose will affect its location, and vice-versa. In order to do so, a Pah Kwa should be surperimposed onto a floor layout to determine the optimum location of your living room based on its desired purpose. Similarly, the 8-point method can help you place furniture in such a way that a specific area of your life can be improved by enhancing your living room Feng Shui. When deciding on the general layout of the living room, the television and/or stereo equipment should be located in the “finance” corner of the room (far left corner from the main living room entrance). As for all other rooms, when sitting in the living room, you should be able to see anyone coming into the room. You should also avoid having your back to a window (or door). It is best to have a good view of all focal points (television, windows, entrances) without being directly in front of a specific item. For example, instead of sitting directly in front of the window or the television, try a small angle. If you like to host several social activities in this room, the ideal locations are on the west side or in the centre of the house. Living room Feng Shui indicates that a conversation area is best laid out with chairs at a 90 degree angle rather than sitting across a table from each other. 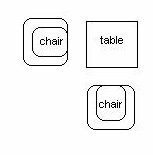 The following drawing illustrates a good layout for 2 chairs and a coffee table. combine the benefits of aromatherapy when you burn scented candles. If this room is too empty, chi will flow too rapidly through the room. Fortunately, there are feng shui remedies that can help. To slow the energy down, you can increase the size of your furniture, add a few plants, a fish tank or some lights in the darker areas, but make sure to not overdo it. Similarly, if your room is filled with oversized furniture, chi will become stagnant and create a feeling of apathy.